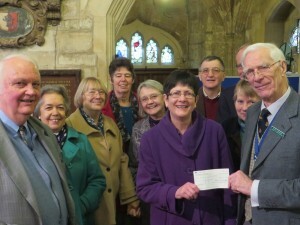 On 6th March 2016 Dr Peter Ormerod, Chairman of the Friends of the Minster, donated a cheque for £20,000 to the Appeal. This is their donation to pay for the 8th bell. The cheque was accepted by Liz Coke. The photo shows Peter and Liz and some of the Friends.